Environmental Preservation and Building Environmentally-Friendly Societies | Toyoda Gosei Co., Ltd.
With awareness of environmental issues, every employee makes efforts to preserve the environment while recognizing the importance of protecting nature and biodiversity and contributing to the creation of environmentally-friendly societies. To move toward the environmental preservation and nature-friendly society envisioned in the TG 2050 Environmental Challenge, we are selecting chemicals and strengthening controls for people- and earth-friendly products and production lines, while ensuring that we always comply with domestic and international regulations and customer criteria. We are also creating habitats for local native plants and animals to make our sites more nature-friendly. To strengthen control of chemicals contained in our products, we manage substances regulated by automakers themselves and by our own company in addition to substances controlled by domestic and international regulations. We watch the trends in European REACH*1 regulations and the EU RoHS Directive*2 and have a system in place to respond rapidly when these regulations are revised. To respond to requests from automakers in each country for information on chemical substances in products, we have devised mechanisms and conducted systems for global collective management of chemical substances that we are currently using in Japan, China, Thailand and Vietnam. We will be steadily expanding this system to places where it is not yet in use. 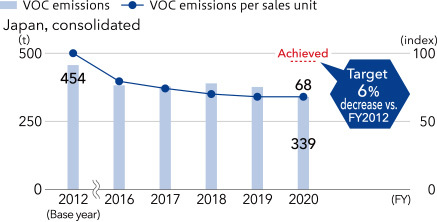 In production processes, we are switching to water-based paint and release agents, making painting lines more compact, improving coating efficiency, and making other efforts to reduce to the Pollutant Release and Transfer Register (PRTR) substances and volatile organic compounds (VOCs). Through on-site visits, we also share information on cases in which VOCs were successfully decreased to promote reduction activities. 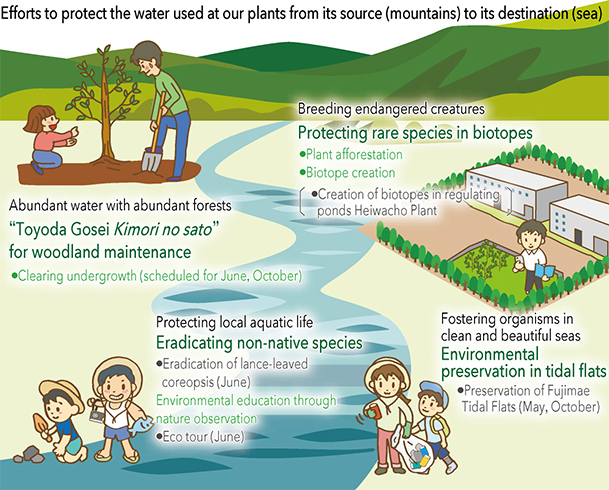 The Toyoda Gosei Group is working actively to protect nature and create environmentally-friendly societies through our plant afforestation project, biotope creation and environmental education. One of our FY2020 targets is to conduct similar activities in water areas and enhance them in coordination with the Toyota Group, government agencies, NPOs and others. We have continued our “Plant Afforestation” activities since FY2009 to create nature-friendly production plants. In these Plant Afforestation activities we plant a large mix of local native species of trees and bushes at high density. These species then grow through natural competition to create true wooded areas that are resistant to natural disasters. 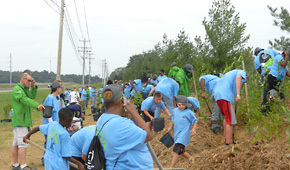 These tree-planting events are organized to build solidarity among participants, who include employees, their families, and local community members. After the trees are planted, employees continue to manage and care for them and record their growth. The seedlings planted in these events are grown in the company from seeds. 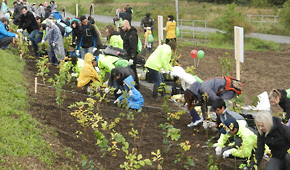 Tree-planting events were held at Toyoda Gosei Czech, s.r.o. 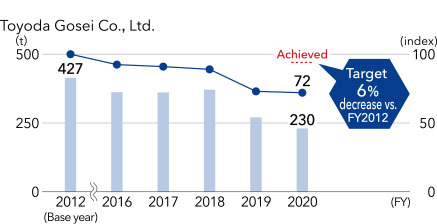 in FY2017, and at TG East Japan Co., Ltd. and TG Automotive Sealing Kentucky, LLC in FY2018. So far, a total of more than 300,000 trees have been planted in 28 locations. A biotope was completed in November 2018 using a rainwater regulating pond*2 at Toyoda Gosei’s Heiwacho Plant (Aichi Prefecture, Japan). 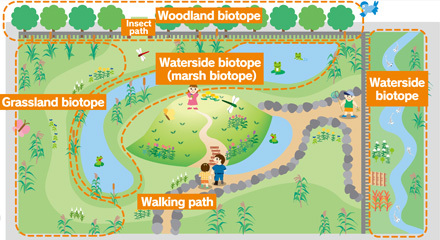 Creating a biotope with a regulating pond is unusual in Japan, and this was the first such effort in Aichi Prefecture. This biotope was developed as an environment to foster rare organisms threatened with extinction. In addition to serving as a gene bank for Nagoya Dharma pond frogs and Japanese medaka fish, seeds of plants such as the Tokai dandelion are provided to other organizations. We also plan to use it as a learning site for local schoolchildren. *1 Derived from the Greek bios (life) and topos (place). An environment that provides a habitat for a distinct assemblage of organisms. *2 Ponds established in residential areas or industrial plants, which function to temporarily store rainwater during local severe rainstorms and prevent flooding. *3 One of nine such councils in Aichi Prefecture, established in November 2016. It consists of 45 groups, including NPOs and schools in the western Owari region, and serves as an ecosystem network. In October 2018, employees and their families picked up large volumes of polystyrene foam, plastic bottles and other trash that had accumulated on the banks of the Fujimae Tidal Flat to protect its ecosystem. The Fujimae Tidal Flat is located in Nagoya and registered in the Ramsar Convention. *4 This provided an opportunity for participants to think about the environment, including understanding that birds and fish sometimes die from eating such trash and observing the animals (crabs, mudskippers, clams) that live in the tidal flat, which is not normally open to the public. This cleanup activity is held every year in cooperation with local residents and an NPO. *4 An international treaty on the preservation and regeneration of wetlands that are waterfowl habitats. It was adopted in Ramsar, Iran in 1971. 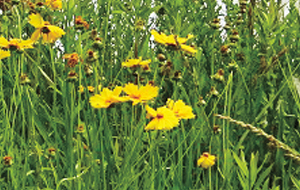 In June 2018, we participated in an activity to get rid of Lance-leaved Coreopsis, an invasive plant species, that was held in the city of Miyoshi in Aichi Prefecture. About one ton of the plant was removed. 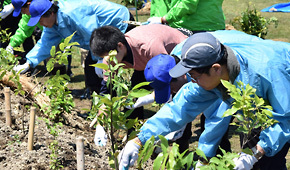 This was done at the request of the prefectural government with the aim of protecting native plant species. The All Toyota Green Wave Project participated in cooperation local residents. *5 This flower was imported into Japan from overseas as an ornamental plant, but it propagates strongly and crowds out native species. It was recently classified as a designated invasive species, and its cultivation and sale are prohibited.